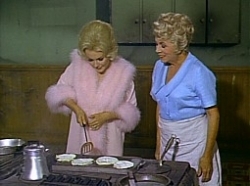 On Green Acres, Lisa Douglas makes “hotscakes” while Petticoat Junction’s Kate Bradley observes. September 26 is National Pancake Day. What about Hungary? On Green Acres, Hungarian immigrant Lisa Douglas (played by Eva Gabor) makes “hotscakes” that have the consistency of rubber and made a noise like “bloop bloop.” They are her specialty—and the only thing she knows how to cook. Below, Lisa is surprised to see the show’s production and writing credits on the hotscakes when she flips them. Later in the video, she brings a bunch of hotscakes to Fred Ziffel, who uses them to re-shingle his roof. And lest you think Hungary has a monopoly on funny-sounding foreigners making pancakes, here’s the Swedish Chef making “flappen jacken” on The Muppet Show. Next We like to drink, drink, drink!